After several weeks with friends and non-stop sight-seeing, I was ready for some "down-time". When we looked to see where we wanted to head to after Missoula, I suggested someplace that really didn't offer much, just a place to park ourselves for a few days. "Let's just do nothing for awhile" I said. Ft Benton MT seemed to fit the bill. Our friends assured us there wasn't really anything there 'to see'. I found a small campground in Ft Benton (the only one) that had a space left - they were pretty full with harvesters. Perfect. Well, that was the plan anyway. 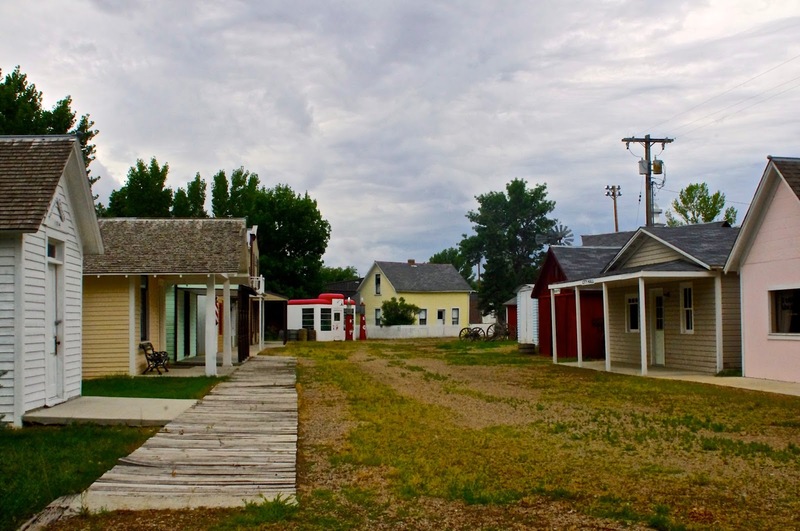 We ended up staying 8 days in this charming town. Our campground host/owner gave us the choicest spot, the largest one right next to a big lovely tree that gave us great shade that we parked our chairs and pulled out our books and sat ourselves right down! That lasted a couple of days...until the rain came. We decided this would be a good time to go into town and see what there was to see and pick up a couple of groceries. As we drove around (all of a couple of dozen blocks of it) we realized it was steeped in Lewis & Clark history and agriculture. 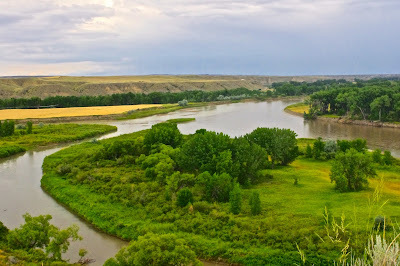 It had a big museum that housed both of those as well as a replica of the old Fort Benton. You could get a two-day ticket to see all of them, so that's what we did. Dashing in and out of the rain drops we began our two-day adventure. What a surprise we had in store for us! Here in this little out of the way town, housed some of the best replicas and museum treasures we had seen so far! It took two full days to see it all too! 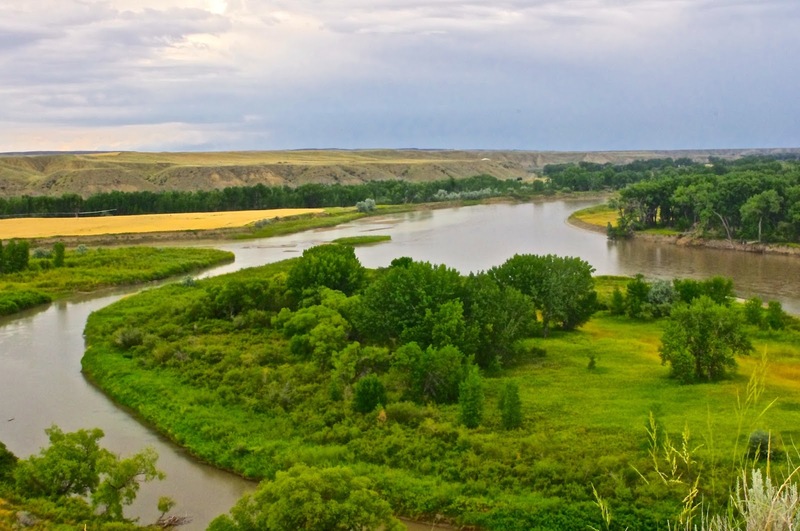 Of course lots of Lewis & Clark (Montana is steeped in that) and bison & Native American history, but what I found most interesting, and educational, was the agricultural part. Having driven all through these plains areas, seeing fields and fields of wheat, canola, vegetables, etc. 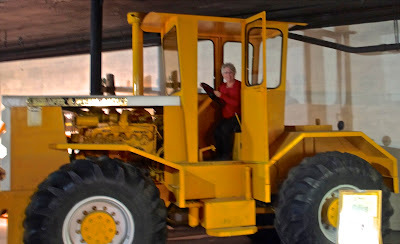 various farm equipment, different sizes of bales, this place helped me to better understand it all. I even got to climb aboard a combine! Both Jack and I are pretty much "city folk" so all this farming "stuff" has to be explained to us, and we actually find it all quite fascinating. What would we do without farmers? Starve, that's for sure. It sure takes a special breed of people to do what they do, and I for one am glad they do! They also had a great display of life in general through the early 1900s and the war years. (I took some pictures of some great quilts for my special quilting friends). They did a nice job of replicating a small town including just about every kind of building you would likely find, including a homesteader's house. Jack, of course did a thorough check of the Blacksmith's Shop and found a rather large anvil he'd not seen before. 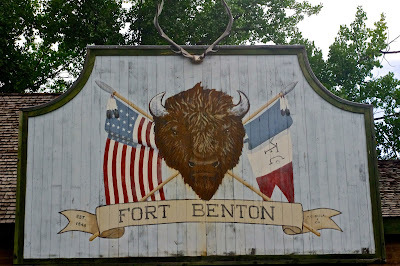 In our 8 days, we managed to see quite a few things in and around Ft Benton. Lewis & Clark"s Decision Point where they had to figure out which body of water was the Missouri and which, what they ended up naming Maria's River. We went into Great Falls and visited one of my favorite artist's works, CM Russell. 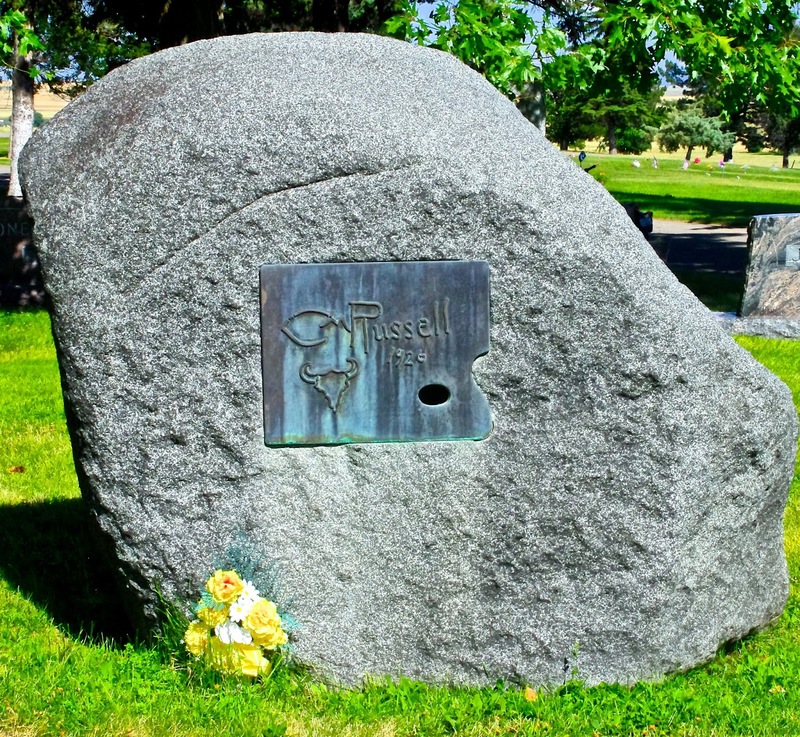 He made his home there and that along with his studio, a large museum and grave site are all in Great Falls. 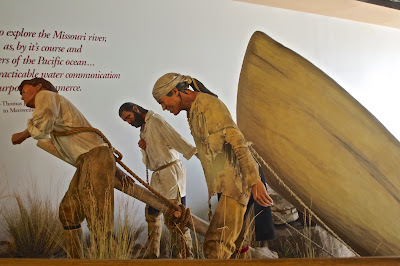 That city also had an extensive museum on Lewis & Clark, the Lewis & Clark National Historic Trail Interpretive Center. All this is to say...there just doesn't seem to be any place that doesn't have "something to see"!